Volunteer for the Visayans (VFV), is a registered non-profit, non-government organization located in Tacloban City, Philippines. It is registered with the local Department of Social Welfare and Development (DSWD) to distribute planned and professional social welfare services to assist underprivileged and undeserved local communities. Over the last decade, VFV has tailored its Volunteer Program to provide not only the best volunteer projects for those looking to Volunteer in the Philippines but has also provided a program that includes some of the best methods of cultural immersion, allowing each volunteer to truly experience the one of a kind ‘Pinoy’ culture. Today, VFV still takes pride in providing one of the most unique volunteering and service based learning environments in the world. 20th of May 2017, VFV gained a Certificate of Appreciation from the Philippine National Police Region 8 for the extra mile of commitment and outstanding service rendered to Police Regional Office 8 during the “Operation Tuli and Drug Awareness Information Drive” in connection with the PNP Project Gandapulis “Empowering Beauty thru Advocacy”. 22nd of November 2016, VFV acquired a Certificate of Recognition from the City Social Welfare and Development Office of Ormoc City for the commitment partnership and dedication services for the continued/ sustainable efforts in promoting the rights of every child towards a better future. 30th of June 2015, VFV in collaboration with its partners International Labor Organization, United Nations Development Program, United Nations Children Fund and Northern Tacloban City National High School have constructed a community center (Alternative Learning Centre) in Brgy. New Kawayan, Tacloban City and have been completed. 8th of July 2015, VFV acquired a certificate of recognition from the Philippine Red Cross for successfully attended and completed (Introduction of First Aid, common situations needing first aid, guidelines in giving emergency care and proper application of bandaging technique). 29th of May 2015, VFV gained a certificate of appreciation from the Department of Social Welfare and Development for the invaluable service and assistance extended to the victims of Super Typhoon Yolanda during its relief operation and post recovery phase. 7th of July 2014, VFV gained the certificate of appreciation from the Regional Office 8 of Department of Education for the enormous support of school supplies & classroom repairs. 28th of June 2014, 8 months after Typhoon Yolanda (Haiyan), VFV gained recognition from the City of Tacloban for the storm surge of hope, love and positivism for the victims in the wake of the Typhoon Yolanda ‘Haiyan’ catastrophe. VFV was involved in relief efforts following Typhoon Yolanda (Haiyan) in November 2013, actively distributing relief goods and planning restoration and rebuilding for the affected communities. Between the years of 2011 and 2013, VFV constructed two additional community centers in far flung areas to increase our ability to provide services to an even greater number of communities. Enrolled close to 200 children from low income families in school, provided them with a daily feeding, structured social welfare support, monthly grocery subsidies, annual medical/dental check ups, and enhanced their education through after-school tutorials with local and international volunteers. Provided over 1,000 international volunteers with the opportunity to Make A Difference in the Philippines through various community placements. Rehabilitated 45 children from scavenging inside Tacloban City Dumpsite, provided them with the means to go to school, to receive school supplies, social welfare support, and livelihood development for their family. Provided skills, training and empowerment activities for over 70 local youth. Built 7 classrooms for remote rural schools and provided hundreds of children in remote areas with school supplies. Provided over 3,100 free medical services to low income communities through the completion of 12 Medical Relief Missions. VFV has established Public Health Nutrition Programs in the rural towns of San Roque, Palo, and Santa Fe, not to mention extended supplementary feeding programs within Tacloban City. Each of these numerous projects combines supplementary feeding for hundreds of malnourished children (3 – 6 years), while at the same time educating parents and community leaders on the importance of nutrition and providing healthy meals on meager incomes. 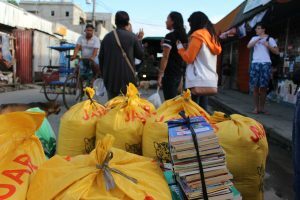 Provided relief goods for over 2,000 natural disaster victims in the Philippines history, including but not limited to, victims of the Southern Leyte Landslides, Typhoon Ondoy victims, and the 2011 Tacloban City Floods victims. Built nearly 30 homes for low income families formerly living in substandard living environments. Provided and sustained a successful micro-financing program for over thirty low income mothers. Gained local recognition from the Republic of the Philippines Department of Education and Department of Social Welfare and Development.